Bored Yak: Isenseven Premiere TONIGHT! Who wouldn't want to use a product called Crack Grease? That poster really says it all, doesn't it? Well, I have a little bit to add. SOS Outreach is a wonderful organization that provides outdoor adventure to at-risk youth. It's similar to a group I volunteer for called Snowdays. Put simply, we all know how expensive snowboarding is, but we all know how much fun it is and how rewarding it is, too. That's what groups like SOS and Snowdays are for, bridging the expense gap to provide the rewards. Rewards to deserving folks who might never get that chance otherwise. The tricky part is raising the money. Enter Isenseven and Crack Grease and the movie premiere format. 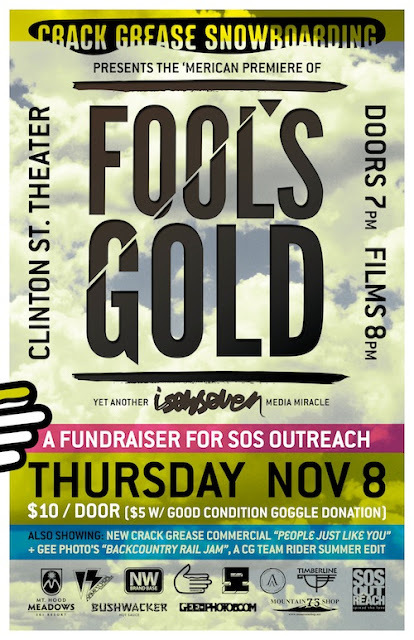 You donate $10 to SOS (or $5 and a useable pair of goggles) and you get to see some good snowboard movies at a theater with 100 of your closest friends. Throw in product tosses (look at all those sponsors), raffles and beer and you've got a solid Thursday night's entertainment. Get there. And don't forget K2uesday next Tuesday benefitting Snowdays.